With the start of the new year and many exciting Territory Wars underway, we’d like to take a moment to remind you when and why to use the Report Guild feature in Territory Wars. This feature is meant to help us find suspicious activity within a Territory War, but since each war contains many unique battles we suggest using the comment section to give as much detail as possible so we have a better idea of what we are looking for. Since this is the sole purpose of this feature it is not the appropriate place to report matchmaking complaints or leave comments for the opposing guild. We found some bugs and crashes and abnormality during this TW, where can we report it? Just for clarity, this means your guild and opponents can potentially be in different active GP brackets and hence fighting for different rewards? You gave them 600 free starting points which we can only make up 300 - is this intentional or a bug? How is that remotely fair??? Bonus for clearing the area makes up the difference. Still not ideal. No, you do make it up if you clear the whole territory. I'm sure this was all unintended, given that hiddenspring was asking for info to identify the problem on Reddit, but it remains true that if both sides clear the map they'll tie. Don't forget to take into account the points for clearing the whole region, which is on top of the points for clearing each individual team. I’ve been waiting over a month for a response to my missing raid rewards bug. Soooo, what the turn around on there submissions? Seems that answers HQ is not living up to the standard it should. I don’t even go there anymore. If both teams had done a full clear we would have lost by points as they started with 600 more points. 10 zones of 3 extra squads is 30 extra squads and at 10 points per win we are able to make up 300 points max. I'm not sure how we can make up the points you're saying we can. They're saying that the amount of points you get for defeating a territory increases as more squads are deployed there so the maximum possible points for full defense deployed and a full clear of the enemy's map will always end up the exact same for both sides even if one is ahead after the deployment phase because they could deploy more squads. Bonus for winning a territory is 450 (or 900 for back) + 10 x max possible number of squads in that territory. The second bit effectively turns the 10 into 20 so evening it out. You are probably still at a disadvantage as you must clear territories to get the points back but in a "clear the map" scenario you will still draw. This system needs to be rehashed, we are constantly outmached by our opponents to the point we're not even going to try any more. This is supposed to be fun and a fair challenge, but it's not working out that way. I'm a member of use your force squadron and we love TW! However we just faced a Russian guild who deliberately played for a tie. They set trash toons in defense with no intention of playing for the win. This has left a very sour taste in our mouths! Personally I'd rather have a competitive battle and lose than deal with spineless guilds who don't even try to win. The quality of life update can't come quick enough to eliminate this senario! They're guild name is [EA_Lanna: Removed guild name. Naming and shaming is against the forum rules. Please refer to the OP by CG_Kozispoon for information on how to report guilds]. In the past we have had issues where our guild members never received the tw to participate. There is no rhyme or reason this needs to be fixed. The issue you have created (EA) is what strategy do you use now in TW.as you don't know the opponents till after defence is set . Then you find you have been matched against a guild 30mill + to your GP . For our next TW . We are seriously considering just putting all rubbish in defence , you get 30 points for your rubbish so that is an improvement....lol . Then just keep all your best for attack phase .that way if you have a mismatch you have a fighting chance of enjoying some of battles in attack phase . But to me I think you just as well forget TW unless you are a 140 mill guild and use yr rubbish in GW and enjoy that .. But in truth you know all this and i would surmise that you are not worried what we think ..
Now the strategy you were trying to get rid of ... Only putting rubbish in defence for a draw ..is proberly the only startegy to use that will make attack phase fun ..
We are a 75mill GP guild with a win rate of 10 - 2 , which will be 10- 3 after this TW . From day one we had taken TW seriously . I think The person responsible for this change is probably the cleverest stupid person I will never meet . You need to sort it out as it was hard to get all guild on board to play this part of game . Now you have ruined that as they just won't bother joining or if they join won't do anything and just collect 1 zeta ..
Our Top Zetas player have 16. So even if they only put 30 players on war, we cannot win against them, we dont have the toons, the gear, the zetas or the ships to get this done. We have a lot of nice wars against guilds that where equal to us and we enjoy it, but if this is going to be the new match ups, then we are going to loose always. I hope you can use this information to resolve the problem, so we can enjoy this wars that are the best thing in the game( and the Sith Raid of course lol), if you need more info i can give you the names of the guilds and more facts, i reported the guild ingame but not because of they are doing cheats or a bug in the game, it was only because of the unbalance match that we get. I dont care that we lost, what I care about is it was not even close to a fair fight.. They cleared the board and we struggled and cleared 3 territories..
We get about 40-45 of our 50 signing up.. so far this next war we have 26 with a lot saying they cant be bothered.. I am hoping we can get that up by a few but the point here is, the matchmaking is killing our enjoyment of what I think is a fantastic game mode. Please hear me out, this isn't a matchmaking complaint. We've been fighting a guild called Звëздная Федерация, in our hangar, they sweeped our CLS teams, some of them with 2 battles, being the first one dealing 0 damage and the next one complete crush, and one player called tapakah173 just destroyed 2 CLS teams, 2 Rey JT with +100k GP and other strong teams by himself. The way they fought is just too fishy, some teams had several battles but no damage received, numbers make no sense and the GP difference is lesser than 20M, being them greater obviously, we've fought guilds with bigger differences but victory came and no fight ever looked like this. PD. I'm attaching a picture of the guild a few weeks before, the guildmaster posted it himself so I didn't hack anything, they underwent a huge change in 2 weeks, from 9M GP to 69GP, do russians reproduce like flies? Edit1: The guy keeps soloing strong teams and removing them like flies, total count: 4 CLS, 2 JTR, 2 Zylos, doublen XII with Old Ben and others. Edit2: 15 wins by him and counting. After raising a support ticket and contacting EA via telephone I've been advised to post on the forum so an in game specialist can have a look and address the problem. Have been mismatched and given an opponent that is 2 prize bands above ourselves. We have no chance of winning this war. The Viscious crew have a guild GP above 90m. Our average GP is 1.6m and theirs is 1.9m. Almost half of their guild members are stronger than our strongest player. If the battle is matched on an average of the strongest and weakest players in the guild this has clearly distorted the figures. I don't understand how we can be paired with a Guild that is so much stronger than ours. We can accept defeat if we're tactically outsmarted but can't accept being given an impossible task. Thanks in advance to whoever picks this up and looks at why we've been given an unfair Territory War. I don't want to point fingers at the opposite guild without knowing how the matching mechanics work but I would like some answers on why we are in a war we have no chance of winning. Awful customer service from EA. Yet again **** on by EA. Same here; my guild:45m GP opponet:65m GP, ty for precise matchmaking. Matchmaking should be based on both active gp and effective gp. If those 2 are both within a couple million of each other, the battle should be very even. Total guild gp is irrelevant to territory wars, and gamers shouldn't use that to judge whether the matchmaking is working, you could still match effective and active gp exactly when facing a guild with 40million more gp than you if they didn't have everyone sign up. TLDR: If you are complaining about facing a guild with higher total GP than you, you are complaining about something that doesn't affect the war. Territory wars have 2 GP stats they use. Neither of those is guild GP or average GP. The first is active GP. That is the GP of everyone who signs up for the war. No way to see this stat for the opponent. This is what determines the prize tier the guild falls into and how many squads they must set. The second is effective GP. This is determined by adding up the GP of everything 6000 gp or over out of the active GP. This is what is used in matchmaking: What is the GP of your useable characters. You only get matched with someone if this invisible number is close. I think they should definitely use both active and effective GP for matchmaking (we shouldn't be playing people from other tiers, period), but the only way you can tell for sure if you are fighting someone in a different prize tier is to count the number of squads they have to set per territory, not by looking at their guild gp, that number is literally meaningless in matchmaking, and should continue to be meaningless. 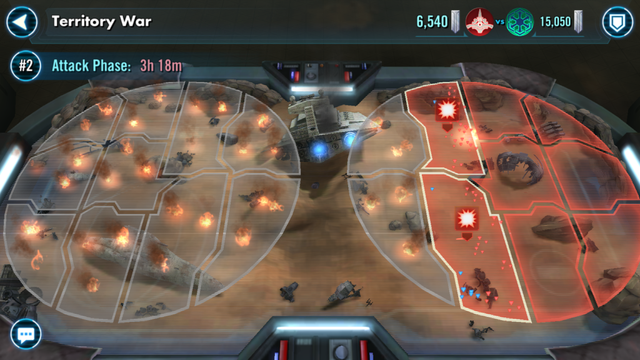 88m vs 110m, two jtr, 24 gold jtr's in their defenses, 1 5 star wampa, 18 gold wampas in their defenses. We're not good, but should not be facing them active gp or not. 49/49 against their 48/48, contacted them through discord. Messed up matchmaking! I am complaining about active GP. I'm complaining that our opponents have over half of their guild stronger than our strongest player. I'm complaining about being continually paired in an unfair wars that we can not win. I'm complaining about extremely poor customer service. I'm complaining about a matching algorithm that doesn't work. I'm complaining about live chat support asking me to post on the forum. I'm complaining about forum posts going ignored. I'm complaining about EA not treating their paying customers with respect. So there is one more metric I would like to see instituted in matchmaking. That is average GP per unit. Add up the total number of characters in their effective gp and divide their effective GP by that. Match people based on that. active GP. and effective GP. I've seen guilds try and manipulate this as well. We were up against a team who were all around 2.2m GP and they had a couple of 200k players to drastically lower their average GP. Our average GP was very similar to theirs but they were aside from two token snide accounts far more developed and far superior in every department. You highlight this with support and they don't want to know. I have a guild of demoralised players who despite their best efforts just can't catch a break. Tactics are irrelevant. It's beyond frustrating and totally unfair.